Jordi Monés spoke last Friday and Saturday at the 5th Refresher Course on Retina and Vitreous at the Fernández-Vega Ophthalmological Institute in Oviedo. 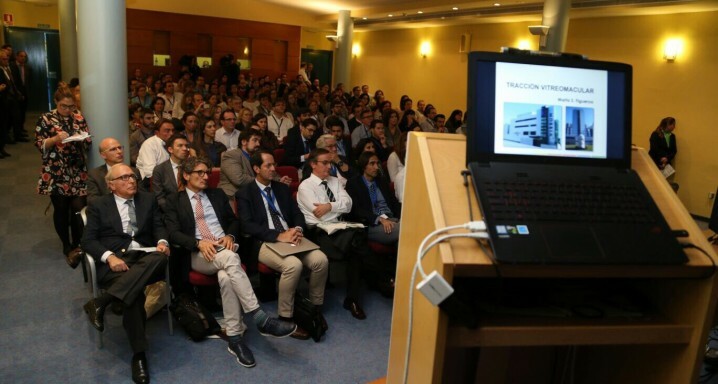 The meeting drew to the Asturian city more than 250 specialists who addressed the most important developments in the discipline. The Director of the Institut de la Màcula outlined to the forum the latest discoveries about geographic atrophy in a session devoted to atrophic AMD and explained the new hypotheses in the physiopathological mechanisms of atrophy from two important questions: have we understood the pathology? Are all atrophies the same? The course also included the analytical debate about complicated clinical cases, in the manner of case studies, in which Dr Monés played a part. This involved a presentation by each expert of an interesting and educational course, featuring complex characteristics, in just 5 minutes. The speaker and the audience then discussed the solutions brought to each case.